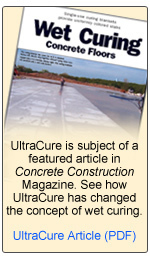 Patented UltraCure NCF/SUN™ is a 7 day indoor/outdoor concrete curing blanket with a white vapor barrier. The blankets are manufactured in rolls, and shipped on pallets to the jobsite. Each pallet contains 32 rolls which are shrink-wrap protected to minimize exposure to contamination until the blanket is applied during the wet cure process. This advantage allows UltraCure to be temporally stored outside during the construction process. Place wet, UltraCure NCF/SUN™ wet cure covering in widest practical width as soon as concrete has hardened sufficiently to prevent surface damage. Sides and end shall be lapped at least 3”. Immediately repair any holes or tears during curing period using wet cure material and water. Cover entire surface area including edges of paving and sidewalks. Install UltraCure NCF/SUN™ moisture containing wet cure covering material as per manufacturer’s written instructions. Wet surface of slab-on-grade with 1/8” to 1/4” inch of water to cover entire surface area of slab, then slowly unroll the product onto slab using the roller squeegee applicator. No portion of this product shall be re-used once it has been put into use on a slab on grade or other concrete application. Maintain UltraCure NCF/SUN™ in place on concrete for a period of not more than seven (7) days (UltraCure NCF/SUN). Continuous inspection for the purpose of maintaining 100% curing blanket contact with surface to be cured is recommended during the curing period. Remove the UltraCure NCF™ curing blanket on the seventh (7th) day following initial installation), and discard along with other construction debris. Click to download Application PDF. UltraCure DOT™ moisture-retaining coverings by McTech Group are natural colored cellulose fabrics with a perforated poly film applied on one side for help against UV degadation. Also available in non-perforated for vertical applications. Both non-staining fabrics have a tensile strength meeting ASTM D-882 and a minimum retention capacity of 6.5(g). Material shall meet ASTM C171-03, ASTM C171-97a and AASHTO M171-00 standard specifications for sheet materials for curing concrete slabs or pavement. Place UltraCure DOT™ wet cure covering in widest practical width as soon as concrete has hardened sufficiently to prevent surface damage. Edges and ends shall be lapped 4”– 6” . Install UltraCure DOT™ moisture containing wet cure covering material as per manufacturer’s written instructions as soon as practical and while the surface of the concrete is still moist. After blankets installation on slab surface, wet top surface of curing blanket with 1/8” to 1/4” inch of water to cover entire surface area of blanket. Monitor surface temperature of concrete and continue to apply curing water to the top of the curing blanket until concrete surface is within 15 degrees of ambient temperature. No portion of this product shall be re-used once it has been put into use on a slab on grade or other concrete application. Maintain UltraCure DOT™ in place on concrete for a period of not less than seven (7) days after placement. Continuous inspection for the purpose of maintaining 100 % curing blanket contact with surface to be cured is recommended using appropriate restraints placed to keep the material in place for outside use where wind could be an issue. Periodic monitoring of moisture retention in the curing blanket is recommended and additional water should be applied if required. 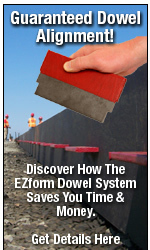 *Please refer to detailed installation instructions of varied methods for local or State applications.